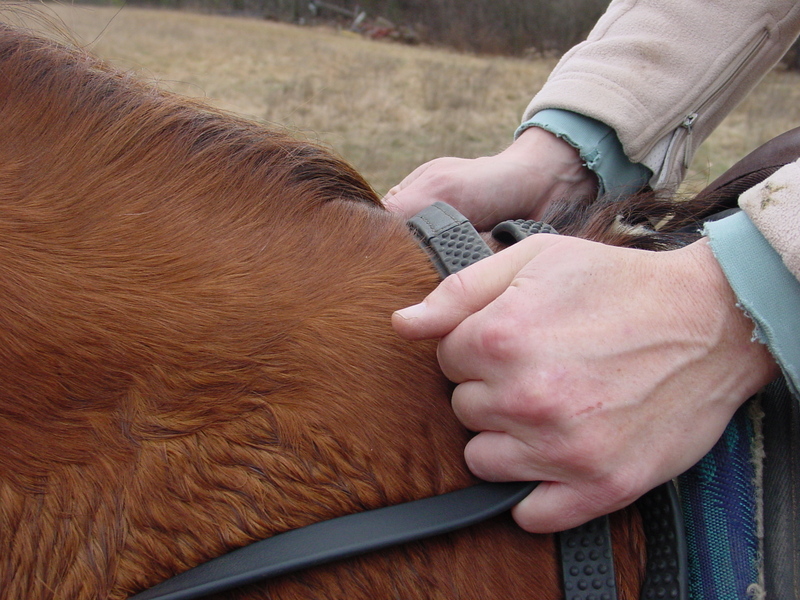 Bridging your reins helps keep you from fussing. A horse like Zelda doesn’t like the “noise” of busy hands. She basically wants me to shut up and leave her alone. Last week I had a lesson. I really should take more of those because those bad habits creep in and before you know it, you’re creating more problems than you’re solving. You’d think after the hundreds — no, probably thousands — of lessons I’ve had in my life that more of it would stick. The challenge of the day was jumping stadium fences. Sounds easy, right? Not always. I’ve never had a problem jumping cross country fences with Zelda. She’s pretty much a point and shoot horse. Ditches? No problem! Banks? No problem! She’s a hoot to take and jump natural fences. We had a few bad experiences with stadium jumps at the beginning of our relationship. There was some bucking, some over jumping and a general anxiety about them that made her flatten and quicken toward them. The more I asked her to balance, the faster she wanted to go. This summer, since it was too buggy to ride out on the trails, I’ve been working on trot poles, cross rails and small verticals. My strategy was to do them often and slowly and make them so boring that it would stop being an issue. This certainly helped, but I still felt that Zelda got a bit anxious trotting or cantering toward a fence. Enter the eyes on the ground. The problem, it seems, is me. Zelda is a horse that likes quiet hands. Very quiet hands. She really wants you to leave her mouth alone and ride off your seat. I wasn’t leaving her alone as we came toward the fence. I was half halting. Now, with Freedom, he takes that to mean, “rebalance a bit and listen to me.” Zelda, not so much. She must have been a hunter princess in a previous life because she really wants me to loop my reins and stay out of her way. I compromised by bridging my reins so that the contact would be ultra steady. Problem fixed! Apparently I don’t half halt going to cross country fences.